The third generation of Google’s much-lauded smartphone line has finally been made official and pretty much everything that had leaked was correct. Coming in two screen sizes, the new handsets have some very impressive specs under the hood with some very interesting Google Assistant and Android Pie software features baked in too! These new handsets are basically identically in terms of specs, apart from screen size/resolution, physical dimensions (obviously) and battery size. The larger of the two, the Pixel 3 XL, also has the much debated notch which people either don’t care about or hate. We actually don’t mind it but will need to spend some time with the phone to see how it works out in normal day to day use of the phone. Admittedly, all of these specs are pretty normal for most 2018 flagships but its the little tweaks, additions and updates that Google has included that will help make the Pixel 3/3 XL stand out from the competition. 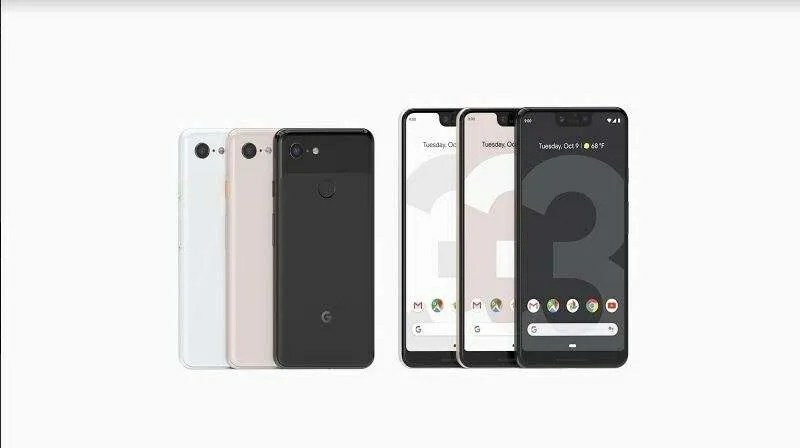 The new handsets will also come with 24-bit Digital Audio Pixel USB-C earbuds in the box which give you quick access to the Google Assistant along with the ability to listen to your notifications. The real-time translation feature, introduced with the original wireless Pixel Buds, is also included with these new Pixel Buds. Probably one of the most impressive features of previous Pixel devices have been their cameras and Google has put quite a bit of focus on improving their single rear shooter along with adding an additional wide-angle lens to their front facing shooter set up. There is also the inclusion of Photobooth Mode which will allow you to capture a photo with just a smile. The introduction of the new wide-angle selfie camera allows you to capture better group selfie shots or to simply capture more of your surroundings when taking a selfie. The front facing camera is still capable of capturing extremely impressive ‘bokeh-style’ selfies as well. For the video options on the new camera, there’s also the new ‘Fused Video Stabilisation’ feature which helps keep your video recording, even in 4K resolution, extremely smooth and judder-free. This feature only works on the rear camera but Google did say that there is ‘digital video stabilisation’ for the front facing camera as well. 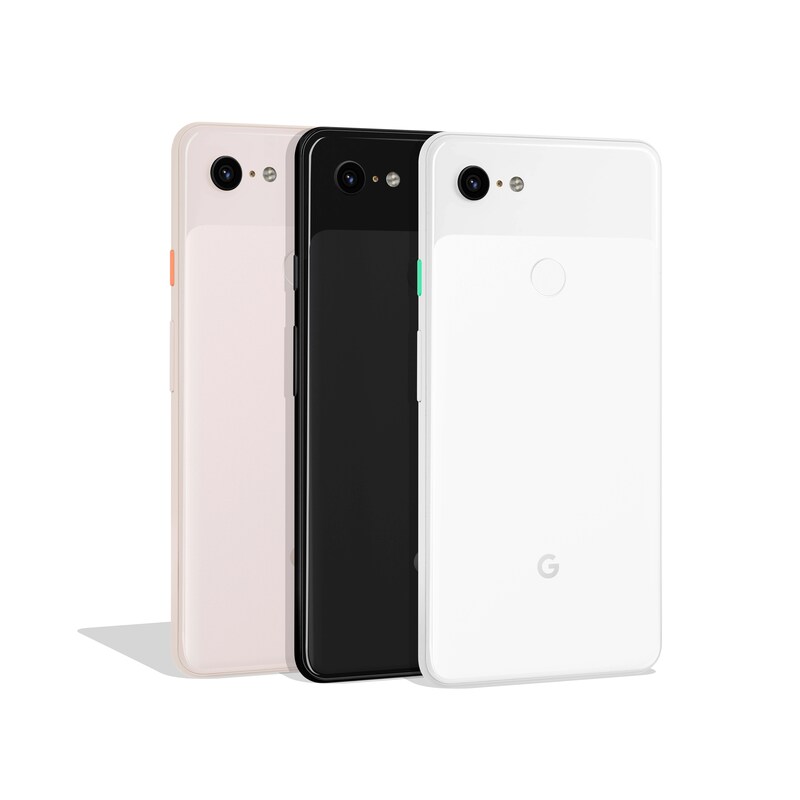 The two handsets will be available in ‘Just Black’ and ‘Clearly White’ both on the store and through Vodafone Ireland and the new ‘Not Pink’ colour option will be a Google Store exclusive. 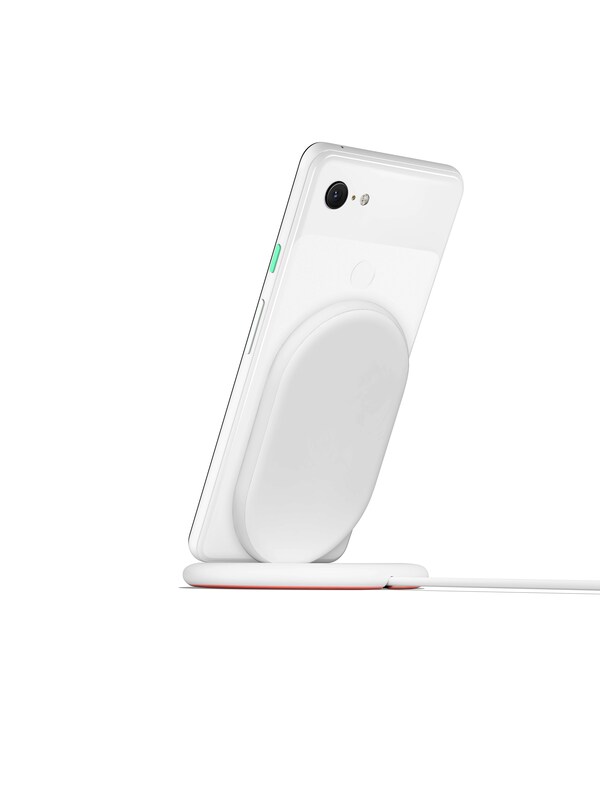 Google also announced the new Pixel Stand which will allow you to charge your new Pixel 3/3 XL device wirelessly. The new stand will be able to charge the Pixel 3/ 3 XL with up to 10W and other Qi-compatible phones up to 5W. The phone will also become its own ‘smart display’ when docked in the Pixel Stand and will allow you to interact with Google Assistant in a variety of ways including features such as the ‘Sunrise Alarm’ which will slowly brighten the Pixel’s display in warm sunrise colours before your alarm goes off. Responses to your Google Assistant request and queries will also be shown in larger, more legible font so as to make it easier to read or view from further away. You can also turn your new Pixel into a digital photo frame by allowing it to access your Google Photos albums. You’ll also be able to have the stand put your phone into Do Not Disturb mode once it’s docked and, when you’re going to sleep, the screen will go dark until your Sunrise Alarm begins to kick in. One of the cooler features is, if you happen to have a Nest Hello video doorbell, when someone rings the bell, you can get a live feed of the camera on your phone when it’s dock in the stand to see who’s at your door! The new Pixel Stand will be a Google Store exclusive and will cost €79 when it launches on November 1st. Samsung announce the Galaxy A9 with FOUR rear cameras!